The Hill reports that Chuck Grassley is working towards a compromise on health care. As ranking Republican on the Senate Finance Committee, Grassley is a key Republican who the Obama administration will have to work with if they are going to achieve a bipartisan policy as opposed to trying to ram down a purely Democratic plan with 50% plus one, using tactics reminiscent of the Bush administration. Considering how little interest many Republicans have in true health care reform can we trust Chuck Grassley? I don’t know if he will have anything worthwhile to offer, but he does deserve credit for helping to save the Medicare program from George Bush. While many conservatives attack George Bush’s Medicare plan as a huge expansion of government they miss the point as to what Bush was really trying to achieve. The plan had two major benefits for the Bush administration. It was a massive give-away program to reward the insurance and pharmaceutical industries for their support. Both liberals and principled conservatives should have opposed it on these grounds. Beyond this goal, the Medicare D program as initially proposed by George Bush was a plan to destroy the Medicare program. Bush’s Medicare plan had two main components. First there were the Medicare Advantage plans where the government pays big subsidies to private companies to treat Medicare patients at a higher cost than if they were under the government program. (So much for the conservative meme that the free market is always more efficient than government). This helps to slowly move people into private plans while running up costs– in a perverse way fulfilling the Republican goal of starving the beast. Bush’s original plan even went far further than this in speeding up the demise of the government Medicare program. The second component of Bush’s Medicare plan was the prescription drug plan. Bush’s initial plan was to only allow seniors to have prescription drug coverage if they dropped their traditional Medicare coverage and changed to private Medicare Advantage plans. There is no doubt that this would have greatly increased the number of Medicare beneficiaries who would change to Medicare Advantage plans. George Bush’s plan would have been very damaging to Medicare. Fortunately it was blocked, largely due to opposition from some people in Bush’s own party. Chuck Grassley was very instrumental in changing the plan so that all Medicare beneficiaries, not only those in Medicare Advantage plans, could receive prescription drug coverage. Jeanne Cummings of The Politco must be at a lack for things to write about as yesterday she resorted to repeating often debunked arguments of the presidential campaign in Obama bites rich hands that fed him. Of course seeing her resort to quoting Mark Penn was a dead giveaway that she didn’t have anything meaningful to say. One striking, if little-noted, trend of the past presidential election was that Obama won the affluent vote — those making more than $200,000 annually — with 52 percent. Moving down the income scale a bit, he and John McCain essentially tied among those making between $100,000 and $200,000. In 2008, exit polls showed the percentage of voters earning more than $100,000 had jumped to a historic high of 26 percent, compared with just 9 percent in 1996. Obama’s strong showing among this bloc reversed a decades-old pattern in which the more money someone made, the more likely he or she was to vote Republican. “If Obama comes down more heavily on them, how will they react? Will their support fade? We don’t know the answers,” said Mark Penn, a Democratic strategist who conducted polling for the Clinton White House and advised Hillary Clinton in the presidential campaign. It’s not as if Obama’s economic policies are coming as any surprise to affluent voters who backed him. During the campaign Obama said he would eliminate the Bush tax cuts for the wealthy. We are hardly going to abandon him should he follow through with this. I noted several times why affluent voters were backing Obama during the campaign in posts such as Why We Latte Drinking Liberal Elitists Can Vote Democratic. Basically it comes down to two main points: I thought that economically I would be better off voting for Obama despite sightly higher marginal tax rates and even if I would up paying more in taxes there were still strong reasons to support Obama over continued Republican rule. Despite all the scare stories, it isn’t until incomes of over $600,000 that tax payers would wind up paying significantly more under Obama’s tax plans, which is why most of us who make over $200,000 and really looked at the numbers didn’t buy the scare stories. It is worth paying a trivial amount in higher taxes for Democratic economic policies which are likely to lead to a stronger economy and allow us to make more money in the long run. Republican policies which primarily shift the wealth to the ultra-wealthy do not benefit those of us making $200,000 to $300,000. We make far more money when the majority of Americans making well under $100,000 have more money in their pockets than we make from money trickling down from multi-millionaires. John McCain would have taxed us slightly less each year, but we would have had a hidden tax under McCain. McCain’s promised tax cuts would expand the deficit even more than Obama’s promised spending increases. Such policies would likely be inflationary and represent a hidden tax on our retirement savings. Economically it makes little sense to vote Republican. Sometimes it even makes sense to pay taxes, and we have to look at how the tax money is being used. I’d rather pay taxes which will go towards improving our infrastructure, improving education, expanding access to health care, achieving energy independence, and cleaning the environment. Such taxes are far easier to pay than taxes raised under George Bush, even if slightly less, which went to pay for the Iraq War and to reward the pharmaceutical and insurance industries for their support. Even if we had to pay higher taxes under Obama, many affluent voters would be willing to do so as opposed to voting Republican. At the time of the American revolution the mind set was “give me liberty or give me death.” If they were willing to pay with their lives to preserve our liberty, we can certainly afford to pay for liberty with slightly higher marginal tax rates. Regardless of any differences in the tax rates, the Republican policies to restrict civil liberties and promote the social agenda of the religious right became intolerable to many affluent voters. In the end it also comes down to rationality. Many educated, affluent voters are simply not going to vote for a political party which denies reality when convenient. We cannot trust a party which lied us into war as George Bush did. A party which has many members which believe in creationism and which deny the scientific consensus on climate change simply cannot be taken seriously in the twenty-first century. The New York Times and The New York Daily News report that Elizabeth Edwards, in an interview with Oprah to air on Thursday, states she has no idea if John Edwards is the father of Rielle Hunter’s daughter. Despite John Edwards’ denials that he fathered a baby with his onetime mistress, his betrayed wife Elizabeth said she has “no idea” whether the former presidential candidate is a new dad. In an exclusive interview set to air Thursday, Oprah Winfrey asks Elizabeth Edwards about rampant speculation that he is the father of campaign videographer Rielle Hunter’s one-year-old daughter. While that question might be complicated, there is a very simple way to establish whether the baby is John Edwards’ daughter. Have an ambulance drive by and watch to see if she follows. I’m certainly not going to vote based upon a politician’s taste in food, but if mustard is a consideration then I did the right thing in voting for Barack Obama. Some right wing blogs such as Legal Insurrection and Gateway Pundit are upset about the mustard which Obama ordered on his well-publicized outing to Ray’s Hell-Burger. They complain that he ordered his hamburger with Dijon Mustard. One commenter claims that if you play the tape backwards he was asking for Grey Poupon Dijon as if that would be something bad. 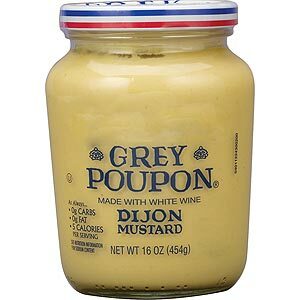 While I often order more exotic types from Zingerman’s for variety, Grey Poupon is my favorite mustard which is commonly available at supermarkets. Only the authoritarian right would get so upset about the type of mustard which Obama requested. This goes along with their ideas on politically incorrect lettuce, wine, and cheese. With all their distortions of the meaning of freedom and the free market, I often think that many conservatives don’t understand what either really means. Many of them would feel more at home with the blandness of Stalinist Russia. Enforced conformity would alleviate many of their concerns. What is it about our freedom to choose and the variety of choices offered by the free market which many conservatives hate so much? There are also accusations that MSNBC covered up the request for Dijon Mustard. I don’t know whether they did, but I’m far more concerned over the manner in which Fox news covered up far more important things, such as how George Bush lied the country into a war. Frank Luntz is an expert at choosing words to influence people. He doesn’t care if the words are honest as long as he thinks they will be effective. I’m sure his distortions will sound convincing to many in the 21 percent who still back the GOP. On the other hand scare stories about bureaucrats making medical decisions won’t fool anyone who has had treatment denied by insurance company bean counters based upon profit as opposed to health care considerations. His scare stories about long waiting times won’t fool those who have no health care coverage at all. His insincere claims of concern for the ability of doctors to make health care decisions look especially foolish when so many doctors are backing health care reform, realizing that the current system is collapsing and the Republicans offer no meaningful alternatives.